How to Beat the Monday Blues | Finding delight. Friday: a day for jubilation, relief, and anticipation for the weekend. For those of us who work all week, Friday can’t come soon enough! Monday: a day to ask yourself one important question: where did the weekend go? For those of us who work all week, Monday comes around again far too quickly. Bah! Make the most of your weekends. We often bemoan the fact we haven’t had time to do everything we wanted, but chances are this is your own fault. Even though weekends are supposed to be about relaxation and enjoyment, that doesn’t mean planning goes out the window! A little forethought goes a long way. Stop spending the day in your pajamas – unless that’s your ultimate weekend goal – and plan out what you’d like to do during the two days you have off from work. Start checking things off the list! (Related: How to prioritize your passions.) Then, when Monday does finally roll around (far too soon! ), you will at least have some satisfaction that you made the most of your limited time off! Get your sleep. Partying hard on a Friday or Saturday night is fine, but that shouldn’t be the case on a Sunday. You need your z’s to think and feel better when Monday morning finally arrives. You will feel better about the day after a good night’s sleep, and you will wake up refreshed, vibrant, and raring to go! And your clients and co-workers will thank you. No one likes a Grumpy Gus on Monday mornings…we’re all in this together! Streamline your morning. There is so much to do on a Monday morning – doing your hair, sorting out your makeup, choosing an outfit, and so on and so on. Such a drag! Still, you can take the muddle out of your morning with a few stress-free tips, giving you a fighting chance after the alarm clock has rung it’s miserable chimes. Improve your workspace. If your workspace gets you down, work out why it might be holding back your productivity and joy. If it’s feeling dull and lifeless, fill it up with personal items and colorful flowers. If you’re trapped in a place with little ventilation, grab yourself some green plants or an air purifier — read about the benefits suggested by Adam Kemp Fitness, they’re pretty convincing! If there is work piled up on your desk on a Monday morning, leaving your brain feeling cluttered, make a point to clear through work on Fridays (or at least give your desk a proper tidying before you leave for the weekend!). Your space won’t seem so miserable when you return. Do you suffer from the Monday blues? How do you tackle saying goodbye to the weekend? Let us know in the comments below! I think we were reading each other’s notes for blog posts this week. Ha! These are great tips! I’ve now come to love Mondays, myself. I’m doing something I love so I always look forward to it. That helps! I’ve started to love Mondays – I’ve started trying to view it as a new start & new opportunity to have a productive week. I totally agree that having a good nights rest will help getting up on Monday easier! I love that, Emily. It’s like a mini New Year’s Resolution but every week! These are wonderful tips Beth! 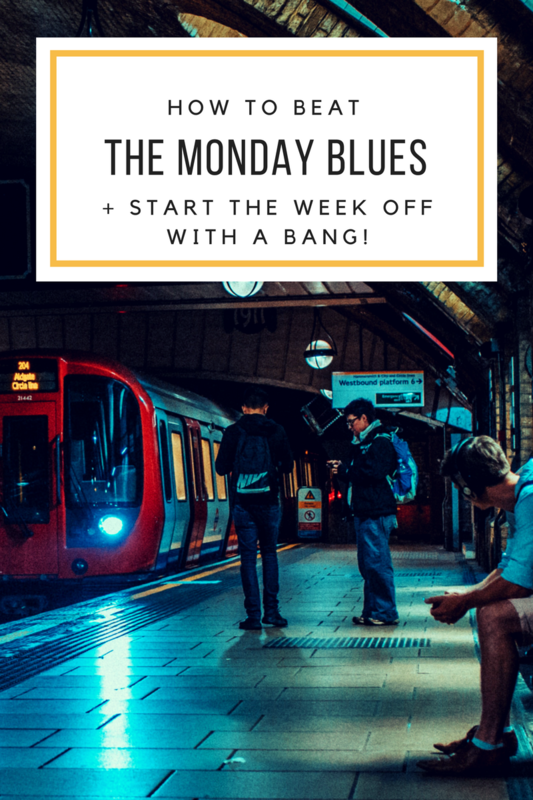 Since i have started working from home I don’t suffer from Monday Blues anymore, in fact I like Mondays, it’s a great way to start the week! I really do need to do better about getting to sleep better on Sundays. I don’t do very well with that and it would help to make my Mondays better.